Our beautiful Gaius Aromatherapy Diffuser is back in stock! If you pick up your orders, please note the new address!! Join Us In Exploring The Joys & Benefits Of Aromatherapy! Are you looking for Essential Oils that are 100% pure and undiluted? If so, you'll love the fact that Dreaming Earth Botanicals searches the world for only the finest in aromatherapy oils and accessories. We work closely with our trusted suppliers to bring you therapeutic quality essential oils in their utterly pure, natural forms, perfect for both your personal or professional aromatherapy work. 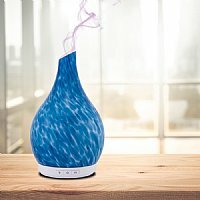 We are also proud to offer a wide and affordable selection of aroma therapy diffusers. In addition to retail sales here on our site, we offer both Wholesale Accounts (with Private Labeling) and Practitioner Discounts. Only the highest quality essential oils and aromatherapy products are deemed worthy of our SomaTherapy label. Try us once and we hope you'll come to trust Dreaming Earth Botanicals for exceptional aromatherapy supplies, caring customer service and your own vibrant personal care!